You can use groups to collaborate with people across your company, even if they don’t have access to Dynamics 365 for Customer Engagement. For example, you can create a group for your sales team and invite other Office 365 users to join the group, and then share documents, conversations, meeting notes, and OneNote information related to specific accounts or opportunities. The groups solution works with any entities, even custom ones. Collaborate through meetings, conversations, notes, or documents. Video: Introducing Groups in Office 365. You need to have an Office 365 subscription which includes Exchange Online and SharePoint Online. Before you can start using Office 365 Groups, the groups solution needs to be deployed and turned on for your Customer Engagement entities. For more information, see Deploy Office 365 Groups. Go to the record that you want to create a group for. For example, Go to Sales > Accounts. On the nav bar, choose the drop down menu next to the account name, and then click Office 365 Groups. In the Welcome to Office 365 Groups for Dynamics 365 for Customer Engagement apps! section, click Create Office 365 Group or search for an existing group to join. You can only connect to groups returned in search for which you are a member. Hover over the search results to see your status. When you add team members to a project, they will be automatically added to the associated group. You can associate existing groups to Customer Engagement records. You don't need to create a new group to create an association. When you delete a group, you'll receive a notification on the Welcome to Office 365 Groups for Dynamics 365 for Customer Engagement apps page so you can take the appropriate action. Group meetings help all members coordinate their schedules. Everyone in the group automatically sees meeting invites and other events. Choose the meeting title to view meeting details. Having a group conversation is a way to communicate with group members. The conversations section displays each message, where you can read, reply to, and create new conversations. To start a new conversion, in the Start a group conversion box, type in your message. In the Conversations section choose a conversion to read and reply to it. Share notes with everyone in your group using the shared OneNote notebook. OneNote lets multiple people write in the same notebook, on the same page, at the same time, and it automatically merges everyone’s changes. In the Notebook section, choose the group's notebook. When OneNote opens, add your notes. When you create or upload a file in the group’s OneDrive for Business page, it’s automatically shared with all members of the group. When you add members to the group, they automatically get shared access to the files. By default, only group members have view and edit access to the files. When you create a group in Dynamics 365 for Customer Engagement, it’s set to private, so only the group members can see information about the group including files, conversations, or even the group itself. To see the latest list of documents, refresh the list using by choosing the refresh icon. To upload or manage all of your documents in OneDrive for Business, click Open OneDrive. 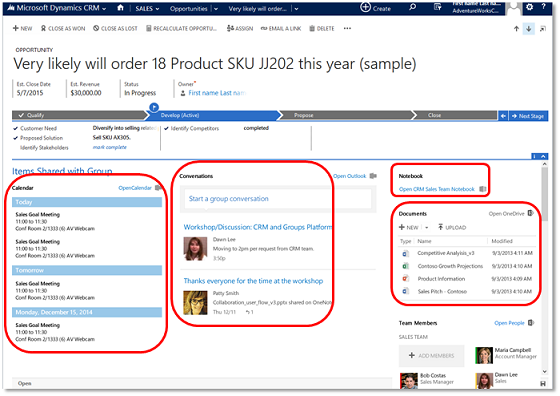 Use the Office 365 Connectors for Groups to connect new or existing Office 365 Groups with Customer Engagement so the group is notified when new activities are posted. To set it up, see Deploy Office 365 Groups.